The last time anyone saw Domonique Holley-Grisham was the afternoon of February 12, 2009. But that hasn’t stopped his family from looking. They unveiled a billboard Tuesday in downtown Rochester to remind people he is still missing, and ask for clues. 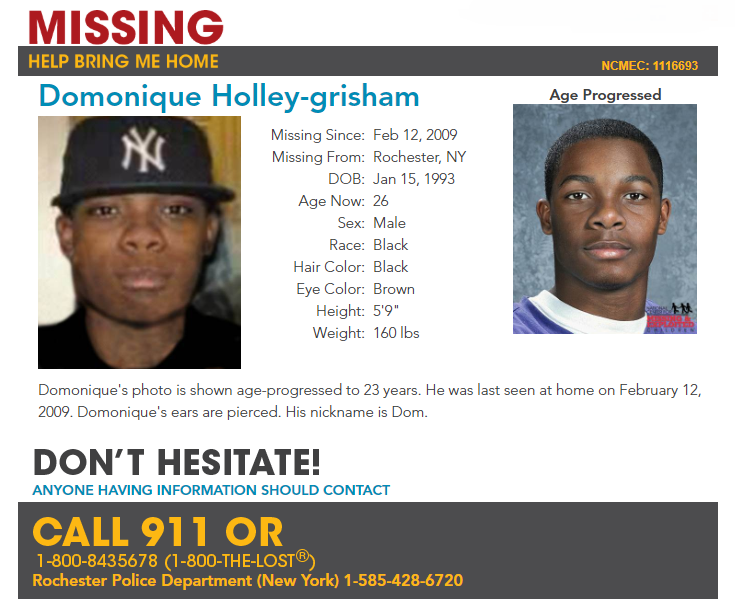 Domonique’s mother Mozell Holley-Grisham is hoping it will help remind people of his disappearance, as they reflect on the 10-year anniversary of when he went missing. Domonique, who goes by "Dom," was last seen 10 years ago in Rochester. At that time, he was described as 5 feet 9 inches tall with black hair, brown eyes and pierced ears. The billboard is up at West Main Street and Jefferson Avenue in the city, where Dom was last seen. Mozell has since moved from Rochester to North Carolina, so she hopes the billboard will spark someone’s memory while she’s away. She says social media has helped the search a lot, with people sharing events and photos, and messaging her on Facebook. But they are still looking for closure. Anyone with information about Domonique is asked to contact the National Center for Missing & Exploited Children at 1-800-843-5678 (1-800-THE-LOST) or the Rochester Police Department at 1-585-428-6720. Mozell says no tip is too small. People are also welcome to attend and event honoring Domonique Tuesday evening at 112 Lewis Street at 6pm.